I'd originally planned to visit Bayern Park on the third weekend in July, but that entire weekend had to be written off after Aer Lingus cancelled my flight. Though I wasn't entirely enthusiastic about it at the time, given the unnecessary trip to the airport at five in the morning, the abrupt cancellation brought with it two unexpected benefits. First, the new coaster at Bayern Park didn't open until the end of August; second, the cost of a round trip journey to Munich in mid-October was about a third of what it had been in the earlier part of the season. An early arrival at Munich, followed by a two and a half minute car rental process at Avis, meant that I made it to the park almost ninety minutes earlier than expected. I'd been trying to figure out why the parks in southern Germany close for the season in early October and the reason became apparent as I stepped out of the car; it was baltic out, with the mercury sitting at just 5°C, and the empty park showed that the local families were staying away. The lack of people allowed me to have my own private exclusive ride session on the brand new coaster. 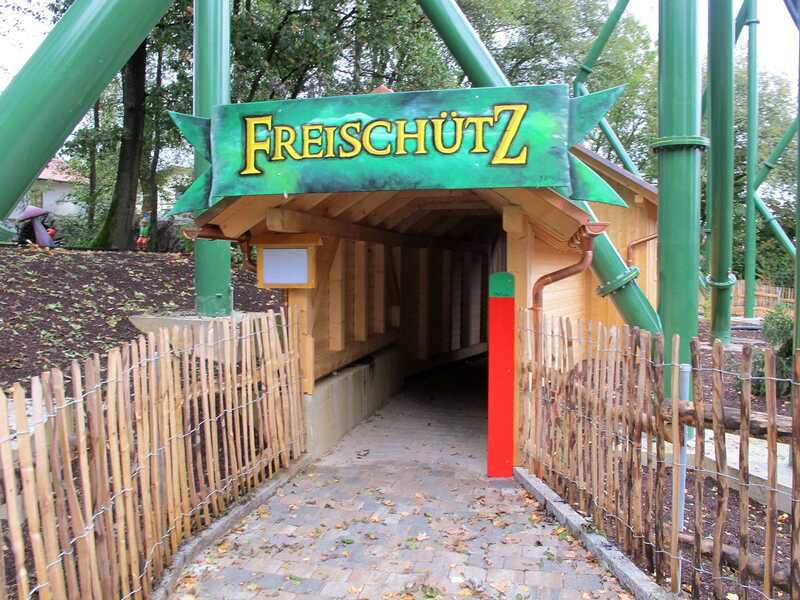 Freischütz (#1695) is a five-inversion launched ride that suffered major delays in its construction, to the point that it wasn't at all clear that it would open this season. The park managed to get the ride operational on the third weekend of August, albeit without any theming. The revised plan is to complete construction work in the off-season, following the broad plot line of the well known opera by Weber. Though the ride has been open less than two months it has already developed a distinct rattle in places, but most of the knocks are absorbed by the comfortable lap bar. Maurer Söhne appear to have finally sorted out the issues with this restraint design tightening itself mid-course, allowing passengers to relax and enjoy the sensations without risking an inadvertent stapling. The track length is relatively short, and it perhaps for this reason that the train is launched through two full circuits, giving ten inversions in a very short space of time. As a seasoned enthusiast I'd like to think that I've a stronger constitution for inverting than much of the general public, but the well known ten inversion coasters stretch my tolerance to breaking point. There were no such issues with Freischütz, though riding four times in the space of ten minutes (for 40 inversions!) did leave me feeling just a tiny bit queasy! The ride is far from perfect; bumpy track work on a brand new coaster is hard to forgive in this day and age. Nevertheless, it is thrilling, and the launch and inversions are not available on any other coasters in this part of Germany. I caught quick laps on my two missing credits, Froschbahn (#1696) and Star-Shuttle (#1697), before heading back to my car. I'd originally planned to skip over Schwaben Park this weekend as I assumed that it wouldn't be possible to get there until after the last admission time. Sitting in the car at Bayern Park I put it into satnav and determined a thirty-five minute margin for error, so I figured why not. In the end, thanks to the derestricted sections of the autobahn, I arrived with a full hour to spare (and a mostly empty fuel tank!). Force One (#1698) was added to the park last year, taking pride of place next to the park entrance. This location is clearly visible from the main road, unlike the rest of the attractions in the park, making it double as an advertisement for passers-by. The design is as near as matters a clone of Crossbow, featuring the same comfortable trains that in many ways mark a renaissance for Zierer. The lap bar is secure but does not rest against the body, allowing the slightly bumpy track to be negotiated without bruising. The layout is quite thrilling with some fast turns that are quite a bit more forceful than the older Himalayabahn. No coaster trip to Germany is complete without a visit to a fair. Though there was a major one taking place in Stuttgart only a few miles away from Schwaben Park my priority was as always the nearest new credits. In the end Mannheim was the closest of three choices, with the added bonus of two coasters of interest; one relocation, and one new. There's not a lot original one can say about any Crazy Mouse (Janßen), and I'm drawing blanks as I write. The only unique feature was an upgraded lighting package that makes the ride look considerably better than anything seen in the British Isles. 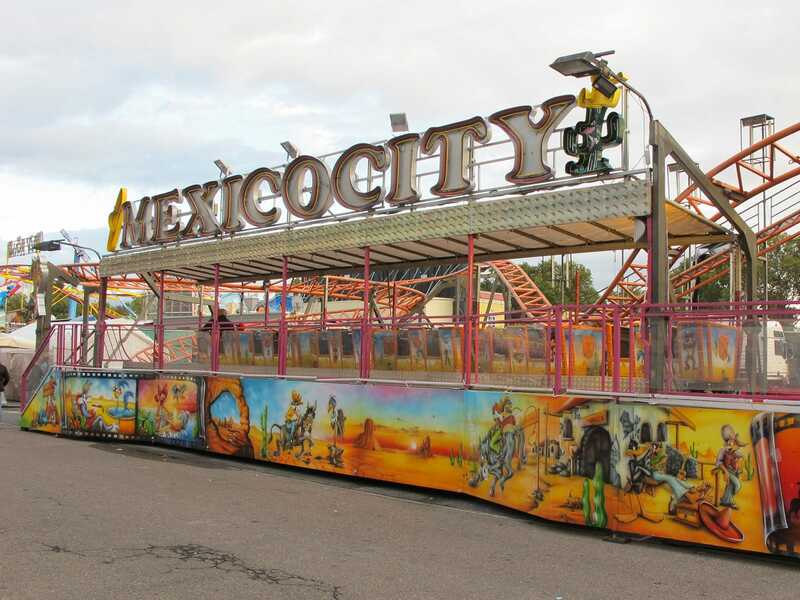 Somewhat more exciting was Mexico City (#1699), a family coaster that proved far more lively than its diminutive size would suggest. The small bunny hop in the final turn before the station had a pop of ejector-seat air time, causing squeals from adults and children alike.